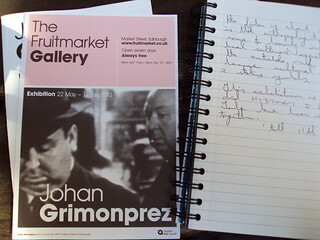 Edinburgh’s Fruitmarket Gallery is running an exhibition of films by the Belgian artist and filmmaker Johan Grimonprez. It runs until 11th July so there’s still plenty of time to see it. It’s well worth a visit but you have to be prepared to sit down for a while as the two highlights last in excess of an hour each. There are a number of items to see here, the main draw being Double Take, Grimonprez’s newest work written by Tom McCarthy and featuring Alfred Hitchcock meeting his double. However, most visitors will likely end up remebering the 1997 production dial H-I-S-T-O-R-Y, a somewhat gruelling film about plane hijackings and subsequent media coverage that will certainly cause you significant stress. If you’re about to fly in a plane somewhere, I strongly advise you not to watch this! It’s a powerful and frightening take on a subject that has only grown in our collective consciousness since the film was previewed in the late 90s. The only solace is that this is an experiment of sorts which demonstrates the shock factor that the media has in reporting terrorist attacks. That is, when you leave the room at the end, that feeling of pure sickness at the bottom of your stomach is your own little piece of proof that the media do engender fear; your own fear is the evidence. Why was this solace for me? Because I realised at that point that Grimonprez is right: this manipulated series of media clips with a voice-over which features extracts from novelist Don DeLillo’s Mao II and White Noise, is put together to show you how horrified the media can make you feel. In this respect I realised after watching it that this feeling doesn’t necessarily come from terrorists or the threat of terrorist attacks, but from the news, so panic over… for now. For some light relief, Kobarweng or Where is Your Helicopter (1992) is a good follow-up. In this shorter film, Grimonprez draws on his experience as a graduate Anthropology student to show how ethnographers have become cultural commodities and status symbols for many Papua New Guineans. The profound effect that ethnoographers have had in certain villages and especially regarding village rivalries is troubling for the discipline but the symptoms of it evident in this exhibition are quite frankly hilarious. The time factor is a little demanding for some of these films, especially Double Take and dial H-I-S-T-O-R-Y, but think of it this way: you’d probably go to see one of these in the cinema at the drop of a hat – they’re so compelling and affecting. You can see them here for free (but only until the 11th July).